Thousands of workers at Sports Direct’s Shirebrook warehouse in Derbyshire are set to receive back pay totalling an estimated £1 million for non-payment of the minimum wage, Britain’ largest union, Unite announced today (Monday 15 August). “But investors and customers alike should not be fooled into thinking that everything is now rosy at Sports Direct’s Shirebrook warehouse. Transline, one of the employment agencies involved, is disgracefully still trying to short-change workers by seeking to duck its responsibilities. 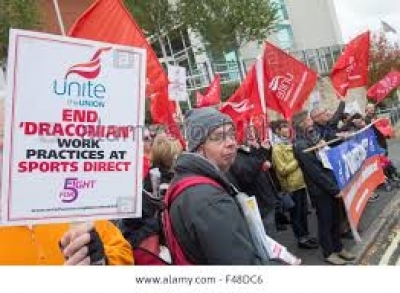 On the use of employment agencies Unite assistant general secretary Steve Turner went on to warn: “Mike Ashley and the Sports Direct board should be under no illusions. The charge of ‘Victorian’ work practices will continue to weigh heavily on Sports Direct until it moves long standing agency workers onto direct, permanent contracts and weans itself off its reliance upon zero hours contracts.